Welcome to the website of the Fibre Guild of Lochac. Lochac is a kingdom in the Society for Creative Anachronism. The Fibre Guild of Lochac exists to promote knowledge of the fibre arts and crafts including but not limited to dyeing, spinning, weaving, tablet weaving, fingerloop braiding, plaiting, ply-splitting, passementerie, felting, sprang, netting, knitting and naalbinding. The Guild’s membership consists of a low-volume mailing list, and there is an active unofficial Facebook group. You are welcome to join these. Hello all, Meroe has come through again with this month’s award cord. Enjoy! If you can contribute the award cord for October, please let me know! Hello all and sorry for the lack of July award cord. The August cord is that unicorn of documentable tablet woven bands: a threaded in four-forward four-back pattern. Well, almost. The blue tablets at the edge of the band rotate consistently in the same direction. Rather than rehash the details here I will instead point you to the excellent article written by Maikki Karisto and Mervi Pasanen who reconstructed the band. If you are willing to contribute an award cord article for September, please let me know. My name is Mistress Victoria Thrakesina. 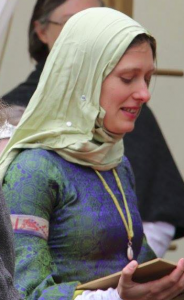 I married into a noble Byzantine family, which has wide interests in the cloth trade and prides itself on the quality of it’s products. As part of my familial duties I spin, weave and dye, because understanding how things are made helps ensure that our cloth is of the highest possible quality. However I am also interested in learning as much as possible about the various fibre arts – you never know when something becomes fashionable and therefore profitable to the family. Mundanely, I am a novice spinner, dabbling dyer and weave as often as I can find time (which is nowhere near enough!). Fibre arts are critical to the SCA as the cloth trade and things associated with it were a major part of the economy of the medieval world. Learning about the processes involved in the fibre trade and how labour intensive they are is a real eye opener, and highlights how casually we treat cloth and clothing today. I love learning about new processes, and will do whatever I can to help other people with either tools or information necessary to learn the various fibre crafts. And I love seeing the amazing things that people make – people in this Guild do awesome things! 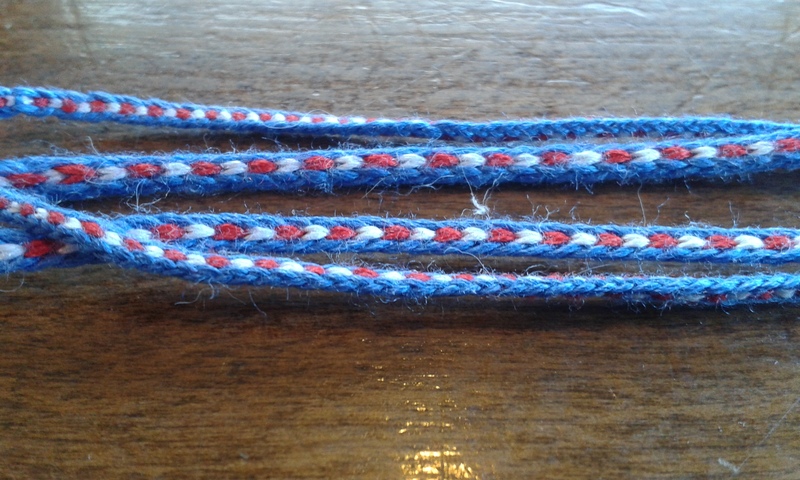 The braid takes 4 loops of one colour, and one of each of two more. The main colour appears at the edge of the band and the middle alternates between the two others. I think it looks best with the main colour darker than the others so when I’m making an award cord I like to make the main colour blue, with one loop each of white and red. That’s the colour scheme I’ll use here. I’m using 60/2 silk and the resulting cord is only about 2mm wide. 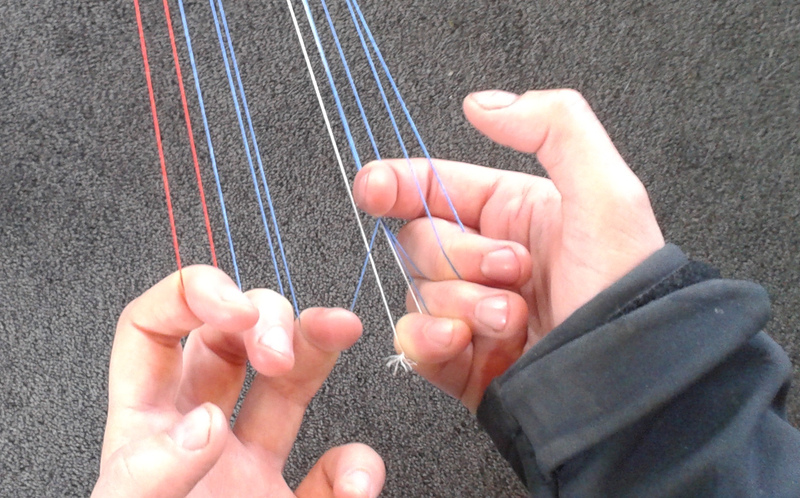 Fingers are numbered from index finger A to little finger D.
Set up with blue on fingers C and D of each hand, red on A left and white on D right. Take A right through B and C right and take C left reversed. It to0k me about an hour to weave 60cm of this band. With a thicker thread it would be quicker. This month’s award cord is again brought to you by Meroe M. Cahill (Rohese de Fairhurst). Every third Sunday of the month, the Southron Gaard Fibre Guild members get together to share what we’re working on and to learn from each other. By popular request, at our March Fibre Guild get-together we had a go at some natural dyeing. And by popular request, I mean mostly requested by me as I’d never (intentionally) naturally dyed anything before. Courtesy of Mistress Eleanora’s weld patch coming ready for harvest, we had a large quantity of fresh weld for use. I learnt that weld was widely used to achieve a bright, reasonably colour-fast, yellow. 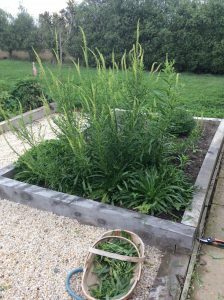 The plant grows as smallish clumps with tall leafy stalks and small yellow flowers (see picture at right). For our have-a-go, Mistress Eleanora prepared approximately 2 litres of dyestuff ahead of time, so we started our day at the mordanting stage. A typical ratio of dyestuff to material is 100 – 200%, and we only had a very small amount of fabric (53g), so this meant we had a very strong dye-bath. 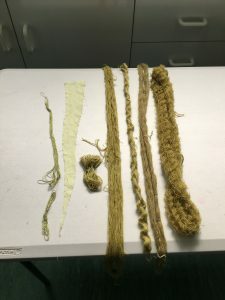 Members had brought a variety of fibre to demonstrate dyeing on: linen cloth, silk thread, alpaca yarn, commercially-produced wool yarn and homespun wool yarn. The fibre was first soaked in tap-hot water, and then prepared by mordanting – soaking the fibre in a solution which opens it up and allows dyestuff to be better absorbed. For our mordanting, we used 5g (10% of fibre weight) of alum and 2g (5% of fibre weight) of cream of tartar. This was brought to the boil and the fibre then simmered in it for 1 hour. The fibre was then transferred to the hot dye pot and simmered again for 1 hour. After this the fibre was rinsed in tap-hot water, and again in slightly cooler water. This, I learned, is to avoid ‘shocking’ the fibres. The end results were interesting, not just for a first-time dyer like me, but also for those more experienced dyers present. The dye came out more green than yellow on the fibre (see picture below). This apparently could have been due to the very strong dyebath, but there were other possible factors mooted e.g. freshness of the weld. This month’s award cord is variations on a four strand plait by Meroe M. Cahill (Rohese de Fairhurst). Download and enjoy! Hello and welcome to the first in a series of posts where our members share a favourite award cord pattern. If you are interested in contributing a pattern, please let me know. I’m going to kick things off with a tablet woven cord. This is a spiral cord based on Cindy Meyers’ instructions and I love the way you can get such a cool pattern with only one colour per card. I’m not going to explain the very basics of tablet weaving in this post, so it may not be the best choice for your very first tablet woven band. Probably fine for your second though! The instructions are quite wordy, but not because the band is complicated, just because I’m trying to explain why you do things, not just what to do. 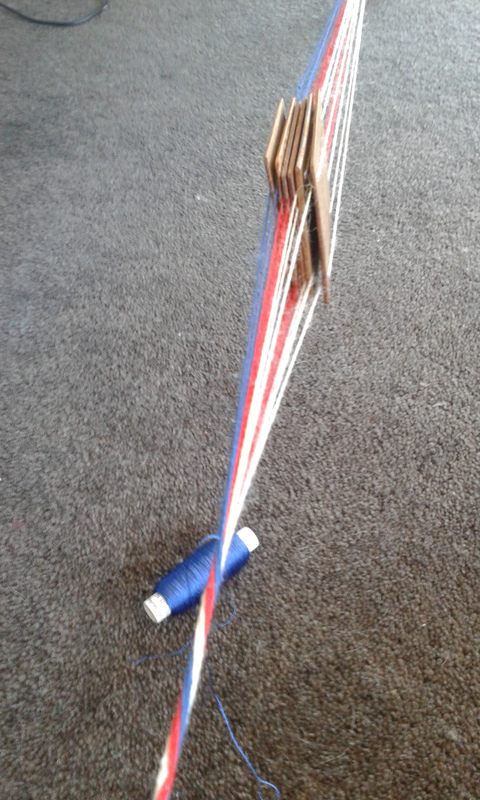 8 120cm lengths of yarn in each of blue, red and white. I used 9000 m/kg wool, but mostly only because I was out of white silk! String up. I wove “backstrap” style with one end of the warp tied to a tablet leg and the other tied to a belt. Now at this point, you could orient the cards in alternating direction SZSZSZ or ZSZSZS and weave all in one direction. You’d get a flat band with stripes running along the length of the band, which would make a perfectly acceptable award cord. If you tried the same thing with all cards in the same direction SSSSSS or ZZZZZZ, the band would look OK while it was under tension but once you cut it loose it would spiral upon itself. To make anything into a tube instead of a flat band, rather than passing the weft from left to right and then right to left, you pass the weft in the same direction every time, and bringing it back over the top of the band and pulling it tight every time so the edges of the band curl up to meet each other. The weft will form a spiral inside the band. 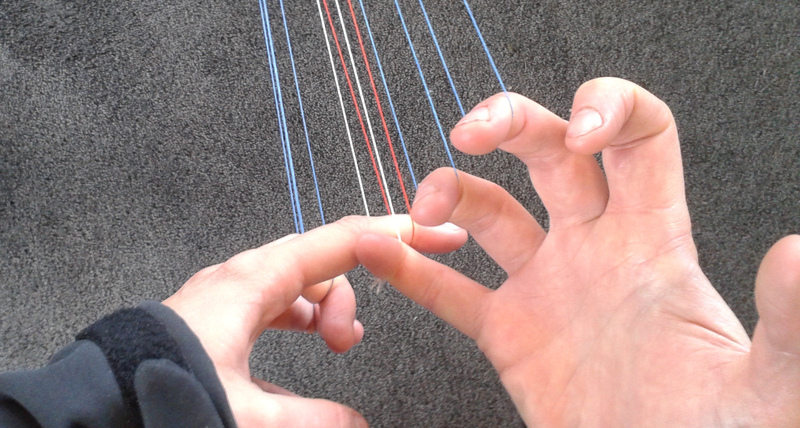 We combine the techniques of threading all cards the same way to create a spiralling warp, and also spiralling the weft, to create a tubular band with lines of colour spiralling up it. The important thing to remember is that the twining of the four threads in a single card needs to spiral in the opposite direction to the spiral of the weft. Otherwise the twist will (mostly) cancel itself out and the stripes will come out straight(ish). So, here’s the plan. Z-Orient each of the 6 cards ie when the card are straight and looked on from above, the threads should run from bottom left to top right. Pass the weft through the shed from right to left close to you, and then turn the cards a quarter turn towards you (in the direction that you would roll a ball to make it come towards you). Beat. That is one repetition. Now take the weft over the top of the band and back through the shed from right to left. Turn the cards towards you and beat again. At this point pull the weft tight so the tube closes itself up. Now you’ve made it through the second repetition! Get the picture? Do a few more! The more you weave, the more the cards are going to want to flip around when you let them go. Be careful to always keep the cards ordered with white on the right. If white is on the left, the band is upside-down. At the point when the cards want to do a full rotation, let them! You’ll start to see the spiral building up. As long as white is on the right, you’re good. In every tablet woven band where you turn the cards in the same direction repeatedly, twist builds up at the far end card by card. 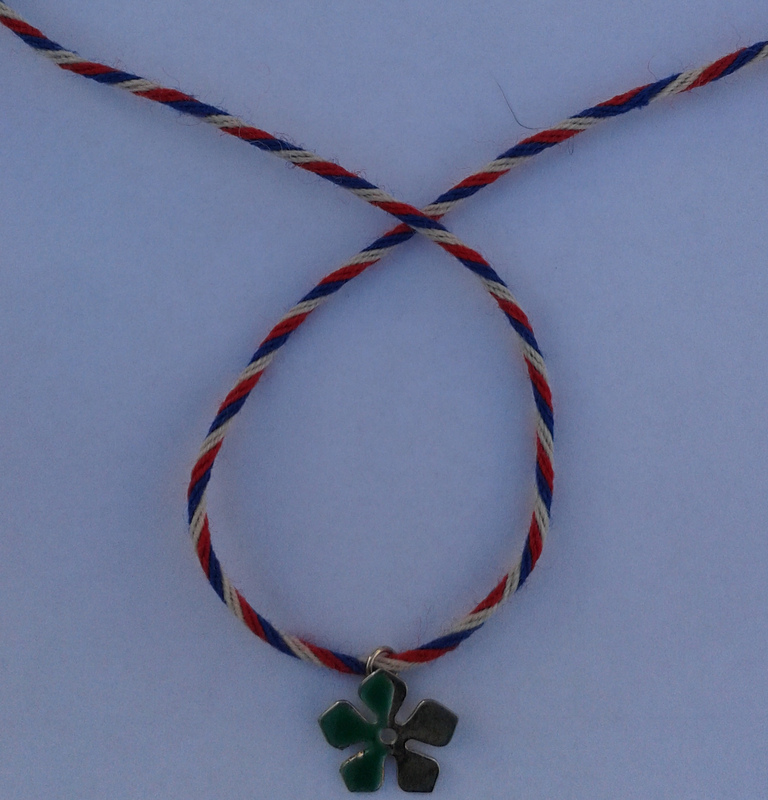 The twist at the far end is the mirror image of the twist in the woven section of the band. In this pattern, because you’re letting the cards flip around as a unit, you’ll get a second type of twist building up. The threads from all the cards will twist around each other, again in the mirror image of what’s going on in the woven band. The solution is the same as for other bands: Reverse your turn direction! This means two things: 1. Start turning the cards away from you 2. Instead of bringing the weft thread over the top of the band from the left side to the right side and then passing through the shed from right to left, just bring it back through the shed from left to right. On the next pass, take it over the top of the band from right to left before bringing it back through the shed from right to left. The spiral of the band will reverse itself, and the unwoven end of the warp will untwist. You will probably see a little of the weft at the reversal point which is why I recommend one of the edge colours (blue or white) for the weft rather than the central red colour. That’s it! Weave until you have about 70-80cm of cord, or until there isn’t enough free warp to keep going. Cut free and you’re done! There are lots of different variations on this pattern: you could do it with only 1 or 2 colours, or with the colours alternating blue-red-white-blue-red-white. 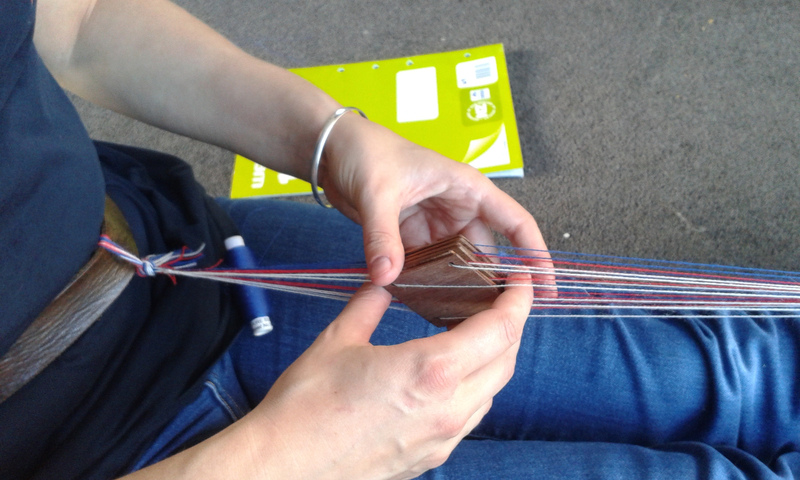 You could use more cards – if you use too many the tube will be loose and hollow in the middle, or fewer – although you may then have trouble pulling the tube tight and the weft will show (although you could use this to decorative effect!) You could a have different number of different coloured cards, eg five blue and one red would give a thin red line spiralling up a blue tube. Welcome to the new website of the Fibre Guild of Lochac. I am your webminister, Mistress Amalie von Brisache. I am also a Master of the Guild, and an obsessed tablet weaver from Southron Gaard. Our website has been moved to WordPress on the Lochac servers because this makes it less technically demanding to maintain and contribute to. There’s not much content yet – although still more than the old website! – but Glynyhfvar (your Chronicler) and I have some plans in progress including a monthly award cord article, blurbs about our members and the fun stuff they get up to, and links out to the blogs and websites of our members who are already publishing their work online. If you have any suggestions for or questions about the website, please contact me and if you have ideas about content for our blog, contact Glynyhfvar.